This clrcult is offered as an exerimental union of the OXO and ONER of GM3OXX fame! L1 has been included to increase VXO shift on 10 metres and higher bands. VRI is adjusted to allow the VNlOKM Vmos power fet to produce about watt pover out. Be careful to adjust the VR1 slider from the earthy end of its track; watch either the power input to the VNlOKH or its power output. Advancinq VRI too much may destroy the output device! Values for the pi- network may be pulled from other sources which include suitable values, e.g. for 8O metres C1 and C2 = 750pP and L1 2lt of 22 swg on a T-50-2. The rig vhich I constructed has been used regularly on 8O, 40 and 30 metres with many solid contacts accomplished. The keying ie clean and the PA stahle, even under mismatch conditions. 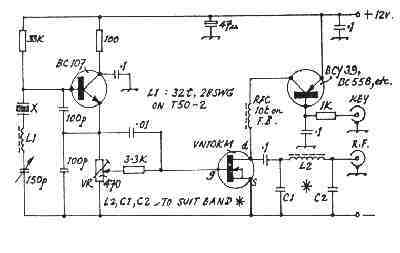 There is appreciable VXO shift on 30 and 40 metre.. and at least 2KHz shift when using my 3560 crystal - with little variation in output power when the 150pF capacitor is at maximum C. The important thing to remember when designing the circuit layout is to keep the leads to the VXO tuning components as short as possible to mininise stray capacitance. Use a small heat sink for the PA - G4VAM's was a copper terminal soldered to the tab.